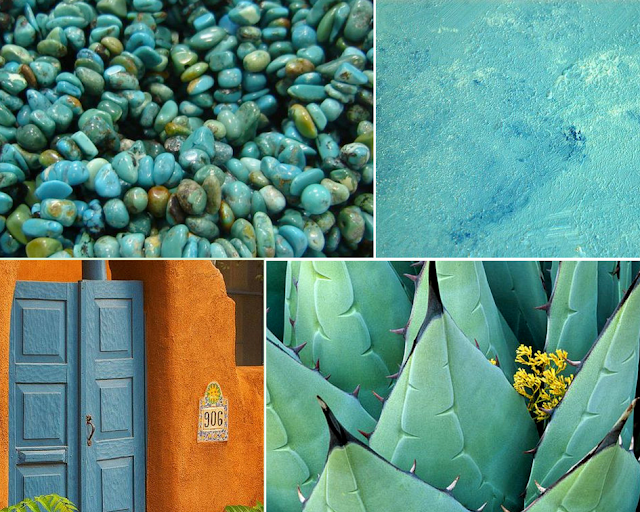 Escape with us to Mexico through our mood board inspirations! Mexican turquoise jewelry began over 2,000 years ago with native tribes using turquoise in their jewelry to craft beads that could be traded as currency and to create beautiful jewelry. Aztec jewelry makers used turquoise and other gemstones to honor their gods. Xiuhtecuhtli was the Aztec god of fire and the name roughly translates to “Turquoise Lord!” Aztec artists made turquoise masks, statues, and mosaics in his honor. Reminiscent of sea and sky along Mexico's gorgeous coastline, shades of azure range from deep navy to vibrant blue-green hues of turquoise or teal. Among Mexican architecture, azure is a popular color for accent walls, furniture, doors and decorative trim. Colorful bands of azure are often found in home accents such as striped rugs and blankets, as well as bold patterns painted on Talavera tiles. I don't know about you ... but we are so ready to look as fierce as Anne Baxter as Nefertiti in our turquoise inspired Mayakoba jewelry! Coming soon: The SB Journal Issue N°3 Part 3 - Earth Bound! Stay tuned for Issue N°3: Part 3 as we share the next key color and mood of our Mayakoba collection.